Another huge turnout of teams were greeted by a glorious summers day, for this, the 3rd round of the championship.Fabcar.co.uk stole the pole from Team X with TGSR and Eau Rouge making up the second row. From the drop of the green flag, Fabcar led the field from Team X, TGSR and Team Zaremba who had moved up to 4th place having qualified in 9th. As the race settled down Team Zaremba moved up to 2nd behind Fabcar with Team X and TGSR in hot pursuit. The next group back, were led by Eau Rouge from Jerkyboyz, followed by Grassroots, GTR, Palmer Racing and Spin Doctors who made up the top ten. Meanwhile Teamtec were already in the pits and K.R.E. Motorsport were in 38th place having failed to make the start. With an hours racing completed, Jerkyboyz and GTR had moved up to 3rd and 5th places respectively and the top five were all still on the same lap. Zaremba then pitted early, dropping them to 20th, whilst Jerkyboyz and Eau Rouge took up the chase to Fabcar and Palmer Racing, Appliance, Kartoon and Team Velocity, all moved up into the top ten. With many teams making strategically early pit stops, the leader board would appear somewhat misleading until all the teams had made at least one fuel stop by the 2 hour mark. Team Zaremba then suffered a wheel bearing failure but combined a rapid repair with a fuel stop and driver change, rejoining in 9th place, leaving Jerkyboyz in the lead from Appliance, Eau Rouge and Team X. With the half way stage behind them Team X took the lead from Fabcar and new contenders Teamtec Juniors moved up into 3rd place just in front of Jerkyboyz. Zaremba had moved back up to 6th place in front of Eau Rouge, TGSR and Kartoon and Lakeside entered the top ten for the first time. With 2 hours to go, Team X and Fabcar were fighting for the lead, and these two were now a lap clear of Jerkyboyz, Appliance and Zaremba. The Clubmans Cup was currently being lead by JKP Racing, in a creditable13th place overall, from Chatburn Challengers, GTR and new comers Team Velocity. As the two leaders made their last fuel stop it was still Team X in the lead from Fabcar who were however, lapping slightly faster and the fight for the last podium place was now between Jerkyboyz, Teamtec Juniors and Zaremba, who were all now on the same lap as one another. 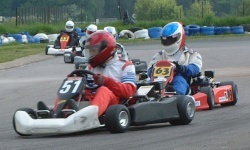 With rising temperatures and furious pace both karts and drivers were suffering from the strain. A whole host of big named teams were now sat at the lower end of the leader board due to an array of problems and in the last hour of racing, contenders Grassroots and Lakeside were doomed to join them. Fabcar's last stint saw them reduce Team X's lead and advantually eventually catching and passing them in the closing stages of the race. Jerkyboyz looked set for 3rd place in front of Team Zaremba who still had Teamtec Juniors, Kartoon and Eau Rouge just behind them. With the chequered flag now in sight, Fabcar.co.uk would take the win from Team X by just 8 seconds, Jerkyboyz were devastated in losing their 3rd place, having come in just under weight and Zaremba gratefully accepted the lst podium spot.